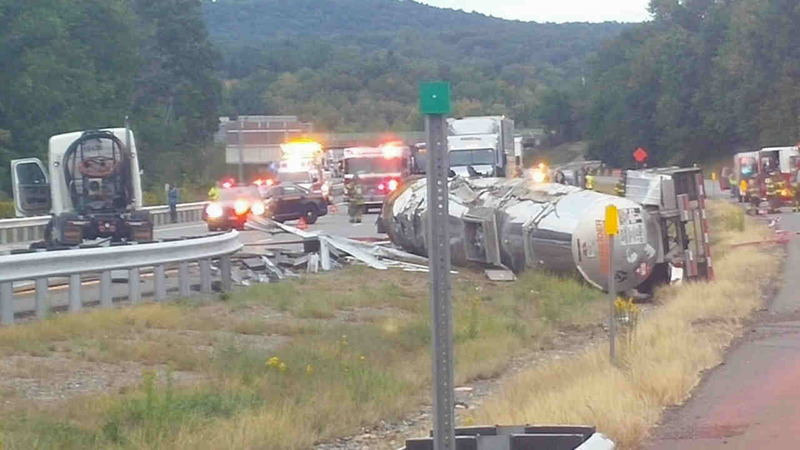 HARRIMAN, New York (WABC) -- Most lanes have reopened after a tractor-trailer overturned on the northbound New York State Thruway Saturday morning. The left lane remains blocked on the southbound side between exits 16 and 17 in Harriman. Other lanes have reopened. The accident happened at 6:45 a.m. The semi was traveling north when it lost control and crossed into the southbound lanes. Officials said the wreck caused a HAZMAT situation. Southbound motorists were diverted off thruway at Exit 17, and northbound drivers were being forced off at Exit 16. New York State Police and HAZMAT teams worked to clear the area.